That’s right, people: The Lost Boys is OLD. Younger than me, you understand, but still old. Fortunately, the boys have aged well and the movie has stood the test of time. What better way to pay tribute to the film than with a tour of the filming locations made famous by the vampires of Santa Carla? Originally, the movie was to be set in Santa Cruz, and this was also the name of the town on screen. 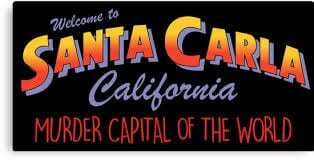 However, being referred to as the ‘Murder Capital of the World’ wasn’t quite the tagline they looking for. Therefore, Santa Cruz refused permits for the production crew. Although the movie was filmed in SC, the town was renamed Santa Carla so as not to scare off tourists. Unfortunately, the city had already been dubbed ‘Murderville, USA’ after a spate of crimes in the 1970s. In the opening scenes of The Lost Boys, Lucy, Sam and Michael are seen driving in from Phoenix, past the now iconic welcome sign. It’s here that Sam spots the graffiti spray-painted on the back, declaring Santa Carla the ‘Murder Capital of the World’. This sets the tone for everything that transpires thereafter. Although the welcome sign isn’t actually there (what, with it not being real and all) the location at West Cliff Drive is instantly recognisable. Grandpa and his house were a perfect match in that they were wildly eccentric and full of surprises. When Lucy, Sam and Michael first pull up in the drive, Grandpa’s flat out on the deck and looks rather dead. He’s not, of course, and leads the family inside to start their new life. He doesn’t think it necessary, until the end, to mention that his city has a *tiny* issue with its nocturnal residents. Luckily, Grandpa’s house is very real, and very much still standing. It’s located a 333 Golf Club Drive but appears to be uninhabited… by humans. Even if you’ve seen The Lost Boys only once, you’ll be familiar with the boardwalk that acts as another character. A LOT happens here and it’s usually the scene for all the important first meetings between the characters. The Boardwalk runs the length of Beach Street (who’d have thought?) and is still central to life in Santa Cruz. Max first sets his eyes on Lucy when she finds a lost boy of her own at the entrance to the store. They get to chatting and end up agreeing to a job and a date. Although the video store isn’t real, the shop and location are. The building on Municipal Wharf is occupied by the Santa Cruz Bay Company and is a souvenir store. The exterior of the store, whilst now a different colour, is pretty recognisable. It’s not run by the Head Vampire IRL, so feel free to browse with bite-free abandon. The store where Sam meets the Frog brothers was Atlantis Fantasy World on Lower Pacific Avenue. However, the premises were destroyed during a ‘quake in 1989 and has since moved. It’s still owned and run by the same guy, but is now based at 1020 Cedar Street. Although not the filming location, the store is very proud of its connection with The Lost Boys. It still attracts visitors from all over the world to have their photos taken with a copy of the ‘Vampires’ comic book from the movie. Have you visited The Lost Boys in Santa Cruz?